If you're not familiar with Spencer Strand's series of play-along CDs, Turn It Up & Lay It Down, you owe it to yourself to check them out. I use them with my students in a variety of ways and have found them to to be extremely valuable in helping me improve their improvisational chops, sight reading, and groove skills. Joe Bergamini and Kevin Fuhrman have developed what they refer to as a "style and analysis" guide meant as a companion for volume one in Spencer's play-along series. This guide consists of an 80-page book and an 82-track instructional CD that contains audio examples of many of the exercises from the book. Following is my review of Turn It Up & Lay It Down Vol 1: Style and Analysis. If you read Modern Drummer Magazine you're probably familiar with drummer/clinician/instructor/author Joe Bergamini who writes the "Rock Charts" column. Joe has also written two other books, Classic Tracks (Modern Drummer Publications) and It's Your Move with Dom Famularo (Warner Bros. Publications). Based in New Jersey, Joe became a member of the prog-rock group Happy the Man in 2003 and appears on their 2004 Inside Out release, The Muse Awakens. In New York, Joe plays the Tony Award-winning Broadway show Movin' Out, subbing for studio and stage drummer Chuck Burgi. He has released three albums with his own band 4Front and, for 11 years, was the drummer in Power Windows, The Ultimate Tribute to Rush. Joe has been performing clinics for Tama, Sabian, Evans, Latin Percussion, and Vic Firth for ten years. Co-Author Kevin Fuhrman, a percussionist based in the Minneapolis/St. Paul Twin Cities area, plays steel drums, drumset, and percussion with a variety of groups. He currently endorses Sabian cymbals, Vic Firth sticks (also a member of the VF Educational Team), Rhythm Tech products, Real Feel pads, and Aquarian drumheads. Spencer Strand, creator of the original series of Turn It Up & Lay It Down play-along CDs, is a drummer /inventor with numerous products to his credit. One of my personal favorites is his Laptop snare, which I will also be reviewing shortly. Other products include the Skratcher, CANZ, Gemini maracas, the Sideman mount, the Mountable Gig Tray, and a few that Spencer says he doesn't want to admit to! Spencer's products are available from Rhythm Tech and other sources. Each of the book's six initial chapters follow the same basic format for each CD track they cover and are designed for use with Spencer's original CD. Included are multiple basic, intermediate, and advanced level grooves, a section of appropriate fills, and Materials for Further Practice that lists exercises from various drum books that can be applied to specific tracks from volume one of Spencer's original CD. As a bonus, sidebars are included throughout the book featuring artists that inspired the grooves, such as Steve Gadd, Bernard Purdie, Jeff Porcaro, John Bonham, among others. Part 1: Fun & Funky - Named after tracks 1-4 on the original Turn It Up & Lay It Down CD, this section concentrates on funk and R&B music styles. Part 2: Rock Solid - As the title suggests, this section covers rock tunes from Tracks 5-10 of the original CD, including styles made famous by artists such as John Bonham and Jeff Porcaro. Part 3: Off To Buffalo - This section focuses on tracks 9-11, which deal with various shuffle patterns. Part 4: Planet Jazz - This chapter covers tracks 12-17 from Spencer's original CD, which contain various jazz styles. Included are explanations of the structure (form) of the standard jazz tune, improvisation, cymbal time, and independence. Part 5: Stuff De Latin - Basic Latin grooves are covered on Tracks 18-20, specifically, Brazilian and Afro-Cuban styles..
Part 6: Fill... Fill... Fill... - Many drummers have trouble keeping solid time especially when moving from groove patterns to fills and back again. The last five tracks (21-25) on volume one of Spencer's original CD are designed to test your time or inner clock by including phrases where the music and click track drops out. This section of the book provides a skelton chart for each track for you to use as a guide when coming up with your own original ideas, and includes basic groove and fill examples that you can use as is. For the final chapter of the book, Joe and Kevin asked a number of great drummers who have been using Spencer's CDs in their teachings to share their own groove and fill ideas. This section provides examples of how those drum pros are applying their ideas to the last five tracks. As I said earlier in this review, I've had excellent results using Spencer's Turn It Up & Lay It Down play-along CD series with my own students. 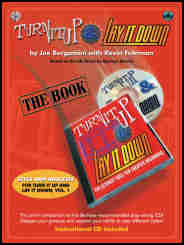 The Turn It Up & Lay It Down Style and Analysis companion book and instructional CD increases the usefulness of Spencer's first volume not only by giving drum instructors additional ideas to use with their own students but by providing those who may not have access to quality drum instruction, a structured way to work through Spencer's initial CD on their own that includes plenty of tips and tricks along the way. This book and instructional CD is a must for anyone who already works with volume one of Spencer's Turn It Up & Lay It Down CD. And, if you aren't yet working with Spencer's CDs, I suggest that you take a look at them for yourself and for your students. They are definitely a worthwhile investment. While this book/instructional CD package from Alfred Publishing is a good value at the retail price of $24.95, those who are wise to Web shopping will be able to purchase it at an even better bargain online.